"This Romaine lettuce salad is a wonderful side dish for a barbeque. By adding either shrimp or chicken, it becomes a meal by itself." Whisk together the lemon juice, garlic and salt and pepper. 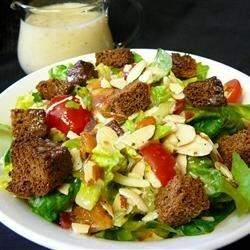 In a large bowl, combine the Romaine, bacon, tomatoes, Swiss cheese, Parmesan cheese, almonds and croutons. Add enough dressing to coat; toss and serve. Tangy, crunchy, deconstructed and delicious! Not bad for a last-minute salad. The bacon was the best part. Will use a lot more salt and pepper next time.